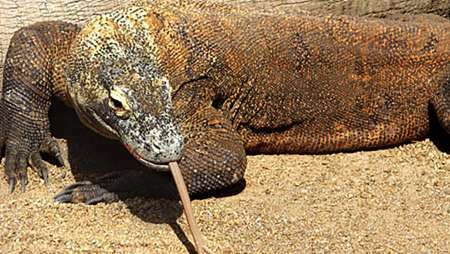 See more than 2,000 animals, including sharks, giant rays, endangered green sea turtles, piranha and a Komodo dragon. This unique exhibit gives you the chance to dive with a higher concentration of exotic sharks than you'd ever find in the wild. 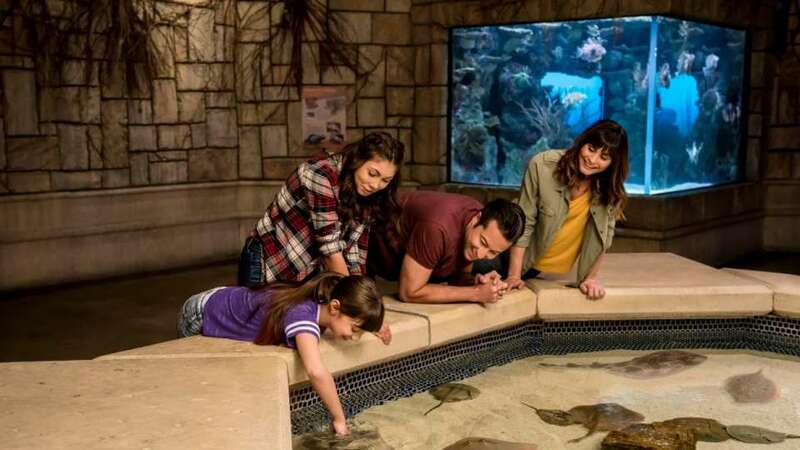 Become an Aquarist for a day and feed our stingrays, shark or turtle in our Animal Encounters program. Shark Reef Aquarium is introducing their newest exhibit – the world premiere of Polar Journey, An Interactive Adventure. Open for a limited time, this interactive experience gives guests a glimpse into the Earth’s polar regions and the animals that call them home. 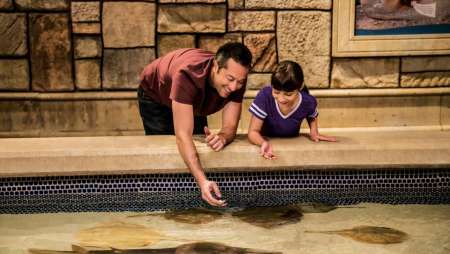 Reach into our touch pool and feed our fabulous stingrays and ancient horseshoe crabs a smorgasbord of shrimp, krill, and fish. Scroll down for more information. 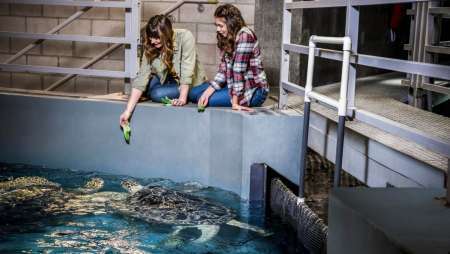 Our new sea turtle interactive feeding program offers you the opportunity to get up close and personal with the gentle giants. Scroll down for more information. Have you ever wondered how sharks eat? Watch it happen during this interactive shark feed. Scroll down for more information. This unique exhibit gives you the chance to dive with a higher concentration of exotic sharks than you'd ever find in the wild. Scroll down for more information. 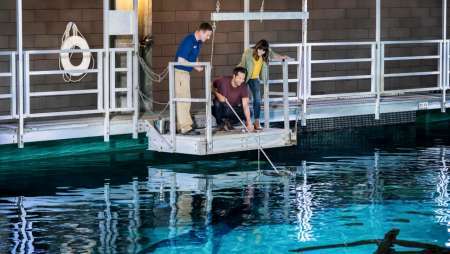 Shark Reef adheres to high standards of animal care, while providing an entertaining and educational experience, as well as contributing to education and research initiatives. 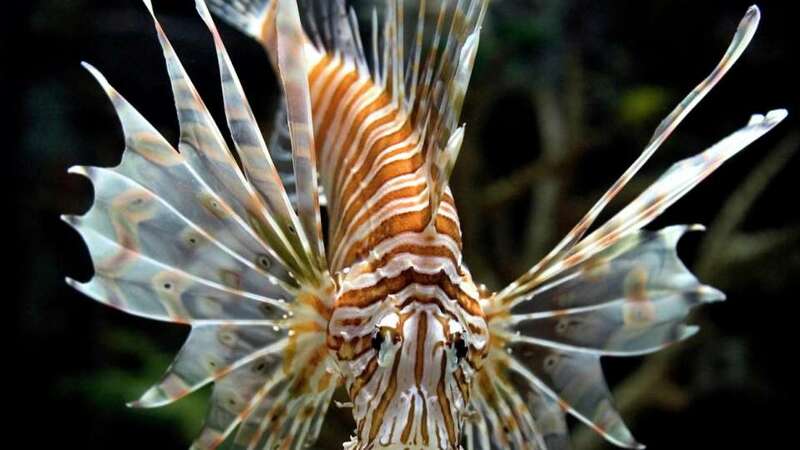 Shark Reef Aquarium is committed natural resource conservation and has implemented many initiatives to reduce our impact including; converting exhibit lighting to LED, installing variable frequency drive motors on our pumps, recycling exhibit water, sorting trash to divert for recycling and buying sustainable seafood. 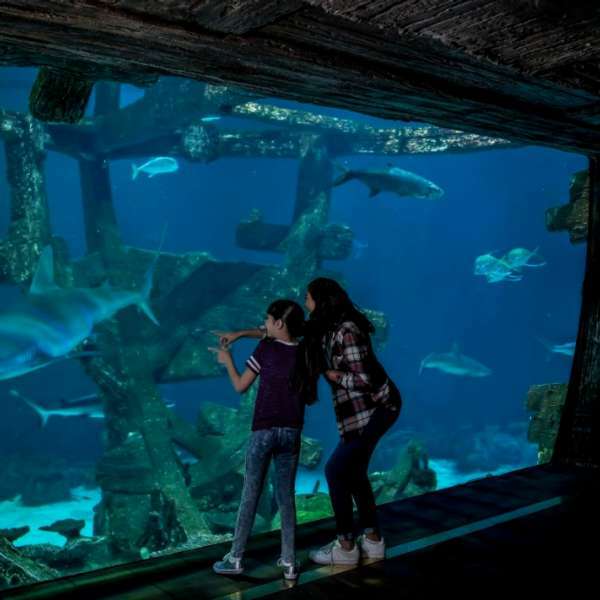 Shark Reef offers a comprehensive educational program for organized school groups of all ages, offering daily one-hour tours, as well as classroom sessions. *Reservations are closed for 2018-2019. Venture to great depths of the unknown at the world’s first Polar Journey exhibit, now open adjacent to Shark Reef Aquarium. This new exhibit is the world premiere of Polar Journey, An Interactive Adventure. Developed by Attraktion! this interactive experience gives guests a glimpse into the Earth’s polar regions and the animals that call them home. Guests will be immersed through eight interactive scenes that include films, touch walls, teaching robot penguins, simulated ice flow and a 270 degree CGI film with motion simulator. Included with the Shark Reef Admission package. Shark Reef Aquarium and Polar Journey ticket packages can be purchased either on-line or at the Shark Reef Aquarium or Mandalay Bay Box Office. Available at the Shark Reef Box Office. Includes: one admission to Shark Reef and one admission to Polar Journey, once 6x9 photo and a souvenir gift. 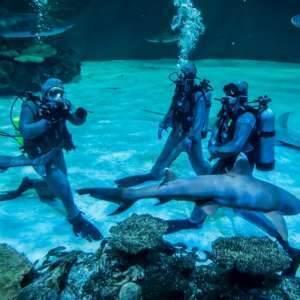 This unique exhibit gives you the chance to dive with a higher concentration of exotic sharks than you'd ever find in the wild. There are over 30 sharks; including Sand Tiger, Sandbar and White Tip Reef Sharks. All divers must be dive certified and 18 years or older. This program is available to Mandalay Bay guests, M life Gold and above, and annual pass guests who are open water certified divers. A cancellation or date change must be requested more than 72 hours in advance. All confirmed dives will be subject to a cancellation or change fee of $75 per diver. Late cancellations (less than 72 hours) and no shows will not be refunded or rescheduled. 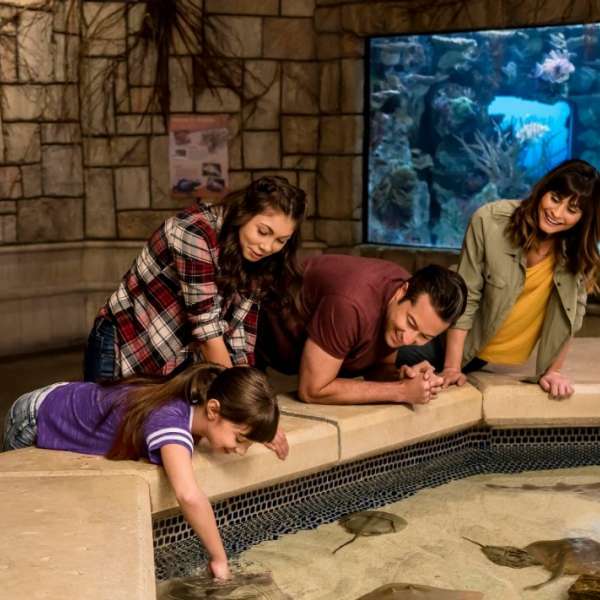 Reach into our touch pool and feed our fabulous stingrays and ancient horseshoe crabs a smorgasbord of shrimp, krill, and fish. 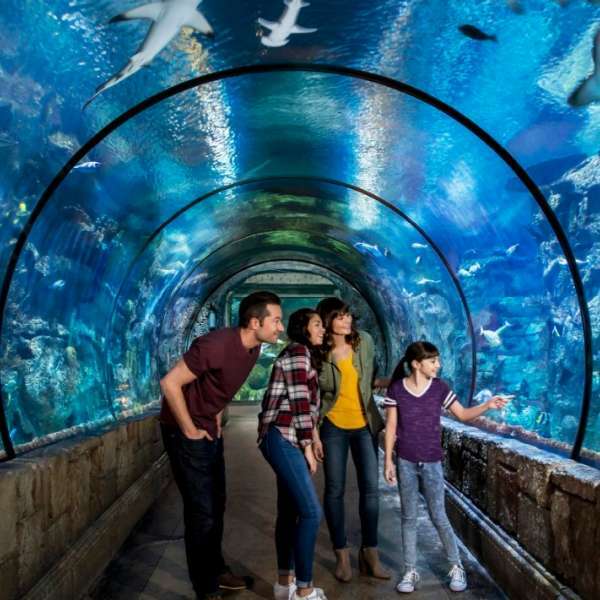 You'll enter Shark Reef Aquarium at 9:15 AM and enjoy the aquarium all by yourself with a private VIP tour before heading off to begin breakfast with the rays. Minors must be accompanied by a paying adult (ages 18+). Offered 9:15 AM daily. Reservations required. Have you ever wondered how sharks eat? Are they ferocious eaters? Watch and decide for yourself during this interactive shark feed. 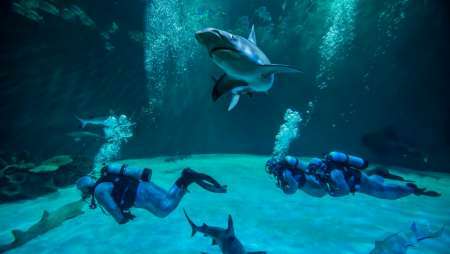 Stand alongside Aquarists as they teach you about how the food is prepared, what kinds of food we use, how we feed them, and other myths and truths about shark behavior. Then grab a feeding tong and try your hand at serving lunch to our resident zebra sharks. Monday, Wednesday and Friday at 1:15 PM Times are subject to change. 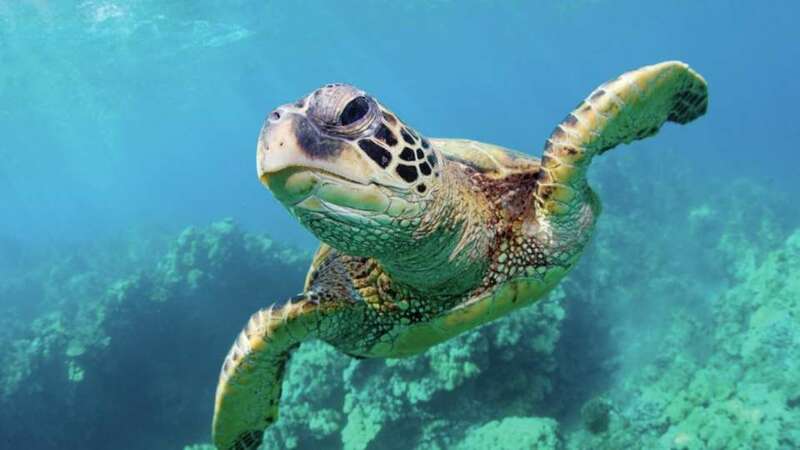 Our new sea turtle interactive feeding program offers you the opportunity to get up close and personal with the gentle giants of Neptune's Fury. 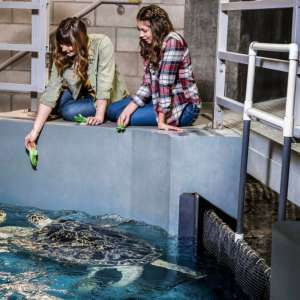 This exclusive, personal interaction allows you to feed our 300 pound sea turtles and go above our 1.3 million gallon shipwreck to experience meal time at Shark Reef. You will also get to meet some of the other toothy residents of this exhibit. Sunday - Friday at 12:45 PM Days and times are subject to change. 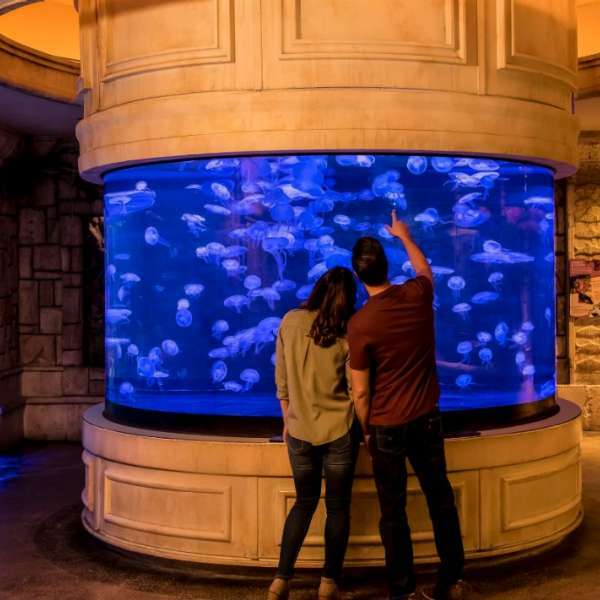 Shark Reef Aquarium is the first and only facility in Nevada accredited by the Association of Zoos & Aquariums. The AZA is dedicated to the advancement of zoos and aquariums in the areas of conservation, education, science and recreation. The AZA accreditation ensures that you are supporting an institution dedicated to providing excellent care for animals. More information on AZA Accreditation. Tour includes work areas where floors may be wet; wear shoes with nonskid soles—no flip-flops, dress shoes, or heels. For the safety of the animals, you will be asked to remove sunglasses, bracelets and other jewelry. Food, beverages, and video are not permitted. To access feed areas, participants must be able to navigate through foot baths and up to 5 stairs. All tours leave on time, late arrivals will be joined with the group, no refunds or discounts for missing all or part of the tour. All tours are subject to change due to animal procedures or unforeseen circumstances. Cancellations must be received 48 hours in advance for a refund. No refunds for no shows or less then 48 hours notice. Management reserves all rights. 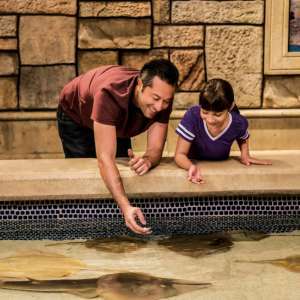 Reach into our touch pool to feel the soft surface of our beautiful stingrays and horseshoe crabs. 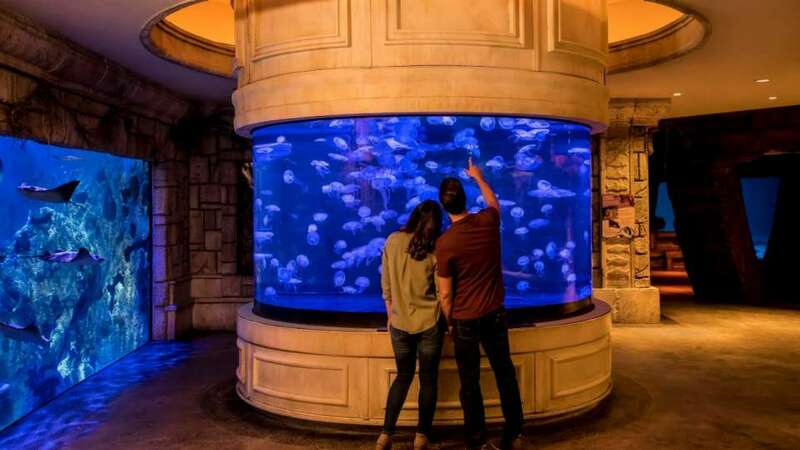 The jellyfish exhibit at Shark Reef Aquarium offers a mesmerizing experience of one of the ocean’s most fascinating organisms. 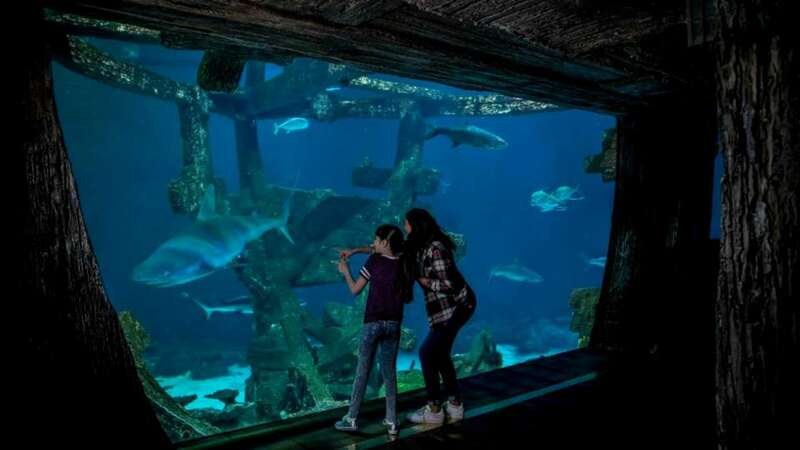 Visit the shipwreck exhibit at Shark Reef Aquarium to see exotic sharks and a variety of fish. 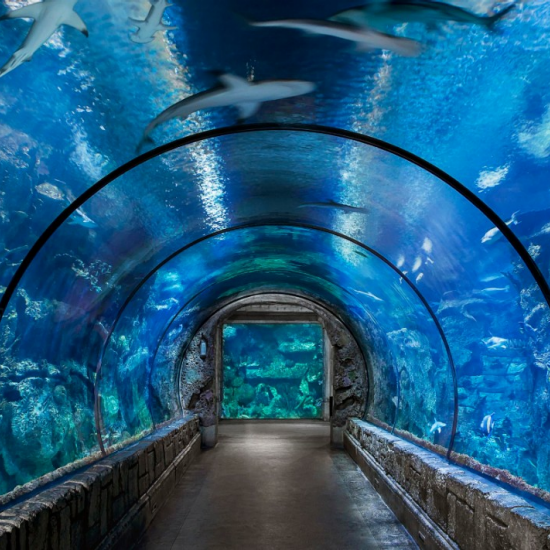 Our Shark Reef tunnel offers a fantastic view of our animal habitat featuring over 2,000 unique species. 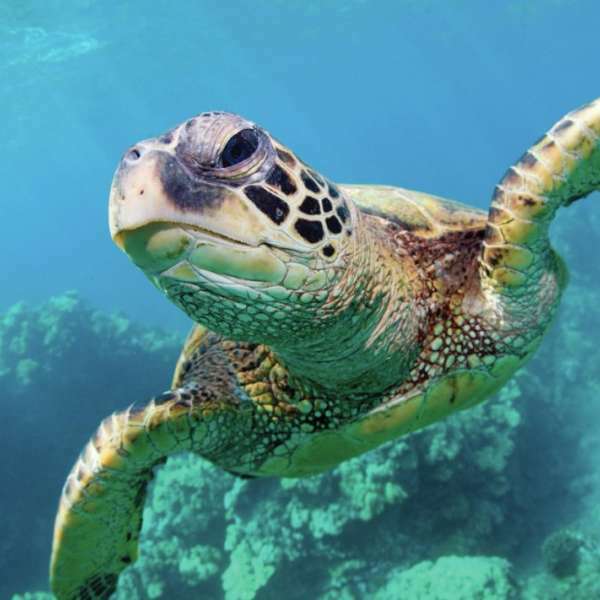 Visit our sea turtles for an exclusive feeding experience at Shark Reef Aquarium. 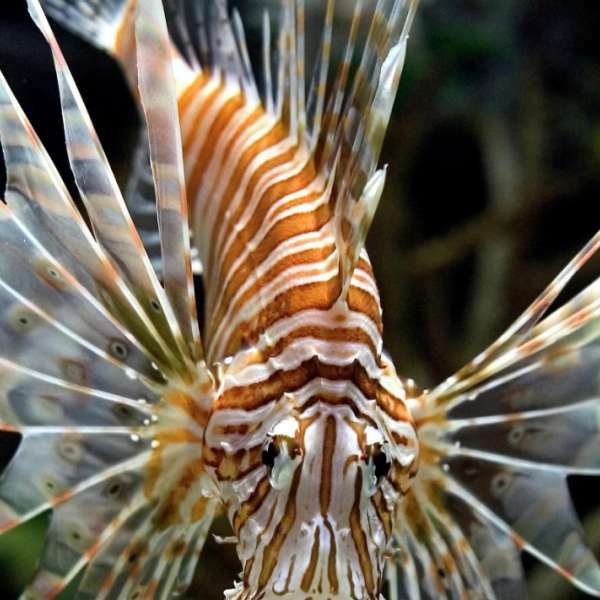 Visit our Lion Fish exhibit at Shark Reef Aquarium. How deep is your love? Make one of your most memorable days even more special with a private tour and a surprise proposal presented by one of our divers. Available daily. Dives are scheduled in the morning and afternoons. Exhibits will vary. $100 for two guests, additional guests at general admission rates. To book this special moment, please call 702.632.4555, select option 6. Walk past guest elevators to the casino floor and follow the pathway along the left hand side. Go straight until you reach the cobblestone flooring and walk towards Mandalay Bay Convention area. 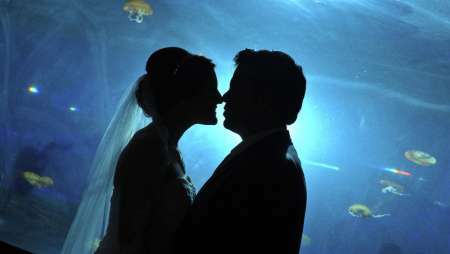 Walk past Border Grill and the wedding chapel, Shark Reef Aquarium is located on your left. Enter the doorways from the garage area and follow the cobblestone walkway towards Mandalay Bay Convention area. 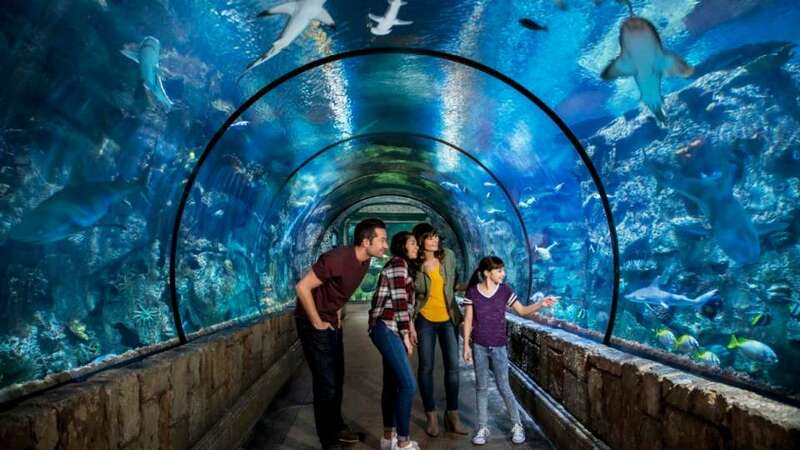 Walk past Border Grill and the wedding chapel, Shark Reef Aquarium is located on your left. *Guests may enter at any time during our hours of operation. All Children 12 and under must be accompanied by a paying adult.